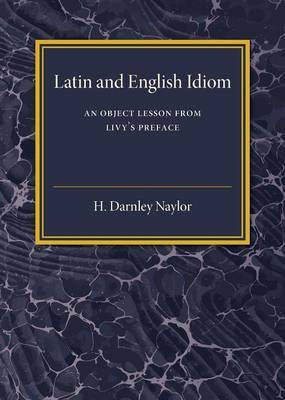 Originally published in 1909 and written by British born Australian academic and Emeritus Professor of Classics in the University of Adelaide, Henry Darnley Naylor, this textbook is aimed at school students as well as undergraduates and provides 'assistance in acquiring Livian style'. Featuring an index for quick reference, this book includes a full explanation of language points and is written for practical use: 'if the reader will cover the columns on the right hand side of chap. iii and then compare his version with that of Livy, he can have no ground of complaint, for he will have learnt a great amount of valuable Latin'. This book will be of value to scholars of Latin, classics and the history of education. A later publication More Latin and English Idiom in 1915 accompanies this book.